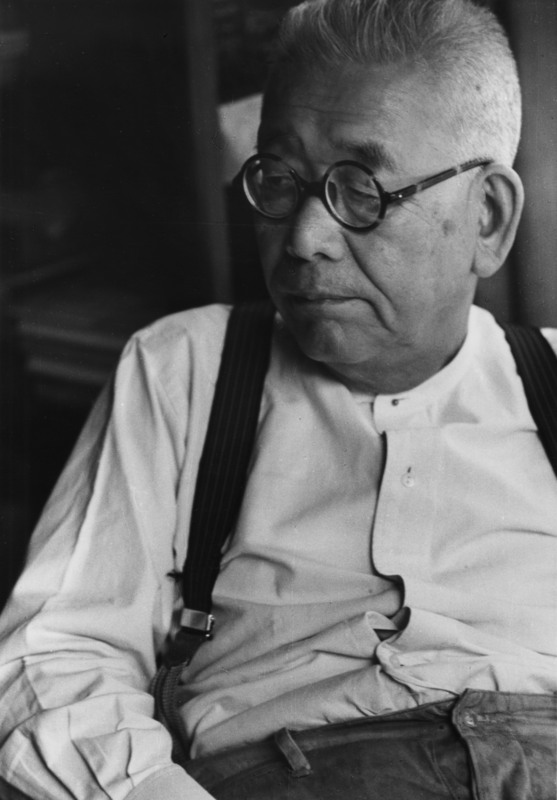 This visionary was the legendary Renaissance man Kitaoji Rosanjin (1883-1959), whose multi-faceted retrospective exhibition is now being shown in Kyoto at The National Museum of Modern Art, Kyoto, until Aug. 16, afterward traveling to Matsue and Tokyo. To pigeonhole Rosanjin merely as a “celebrity chef,” before the term even existed, however, is a great disservice to a man who also knew how to wield a paint or calligraphy brush, bore with a wood-carving tool, spin the potter’s wheel, and design lacquer vessels with the same deft skill as he used a kitchen knife. 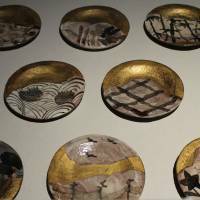 In fact, it’s not an exaggeration to say that in all of Japan’s long history of greatly varied art-craft forms there is no one person who was so acclaimed in as many styles as Rosanjin, and for that reason exhibitions about him are often organized every few years. Yet of all the Rosanjin exhibitions I’ve seen over three decades this one ranks up there as one of the most extensive. There are five cavernous exhibition rooms, with a few side cubbies that replicate settings where one might have once indulged in a Rosanjin meal, or today can still use his vessels, such as at the famed restaurants Kitcho in Kyoto or Kyubey in Tokyo. 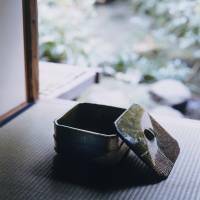 The stunning array of food vessels on display highlight so well one reason Japanese cuisine is now greatly admired the world over: the visual aspects of the vessels — textures, tones, forms — are treats for the eyes in and of themselves. One expression, though, that cannot be forgotten when digesting the exhibition is “yo no bi” or “beauty through use,” meaning each work comes “alive” when a chef places even just one cherry tomato on it. 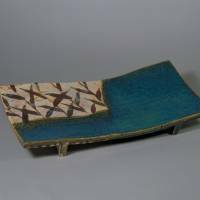 There are lots of works inspired by historical stoneware, as well as by the history of porcelain and lacquer. In his early years, Rosanjin was smitten by Ming Dynasty (1368-1644) Chinese wares and thus we find in the first exhibition hall many examples of his interpretations. Of particular note is a playful abalone-shaped vessel upon which Rosanjin drew a shrimp, a sweetfish and a crab in underglaze blues, amid a colorful depiction of three bundles of leaves. Crabs would later be a theme drawn boldly in the center of roughly-textured glazed-body dishes; some of Rosanjin’s most copied vessels even to this day. Other Chinese influences include red-overglaze enamel and gold-leaf on yellowish-green enamel overglaze. Of course the Japanese styles Rosanjin championed are many indeed, and include Iga (Mie Prefecture), Karatsu (Saga Prefecture), Shigaraki (Shiga Prefecture), Bizen (Okayama Prefecture), Kutani (Ishikawa Prefecture) Kenzan-style (Kyoto) and Shino, Yellow Seto and Oribe (Gifu Prefecture). 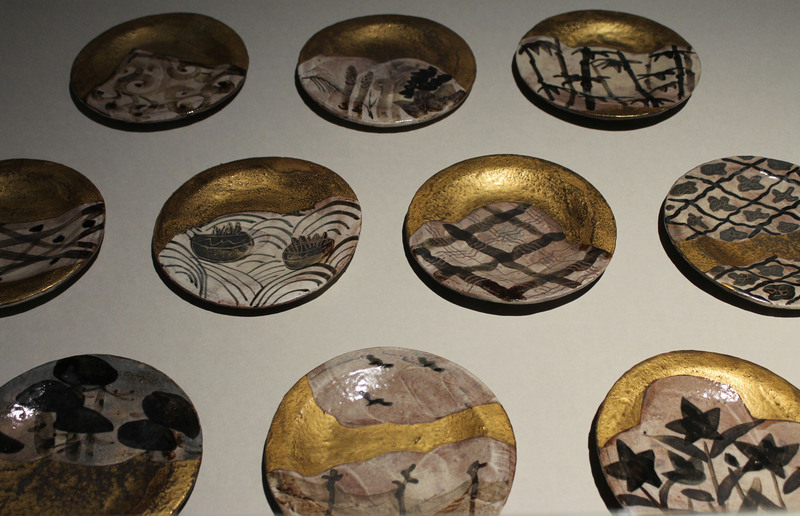 He didn’t travel to all these places to work but had a studio in Kita-Kamakura where he employed a number of potters versed in these styles to assist him, ordering clay from all over Japan. 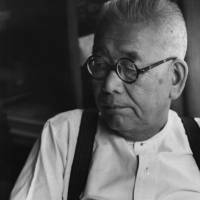 The last style noted — Oribe — is especially important as it’s the style that led the Japanese government to designate Rosanjin as a Living National Treasure, a status that Rosanjin declined to accept. I’ve heard two theories as to why: The “buffoons” who nominate had no understanding of art and thus the designation was meaningless to him, or one of his apprentices was offered the designation before him and so he viewed the offer as an insult. Whichever case, you’ll see a lot of Oribe vessels in the exhibition, including a long-rectangular manaita platter, which is a Rosanjin original. Rosanjin was not one to waste anything, especially after World War II. In the catalog, it’s noted he used all parts of a fish when cooking, including the scales, and he scolded cooks who threw away radish peels. 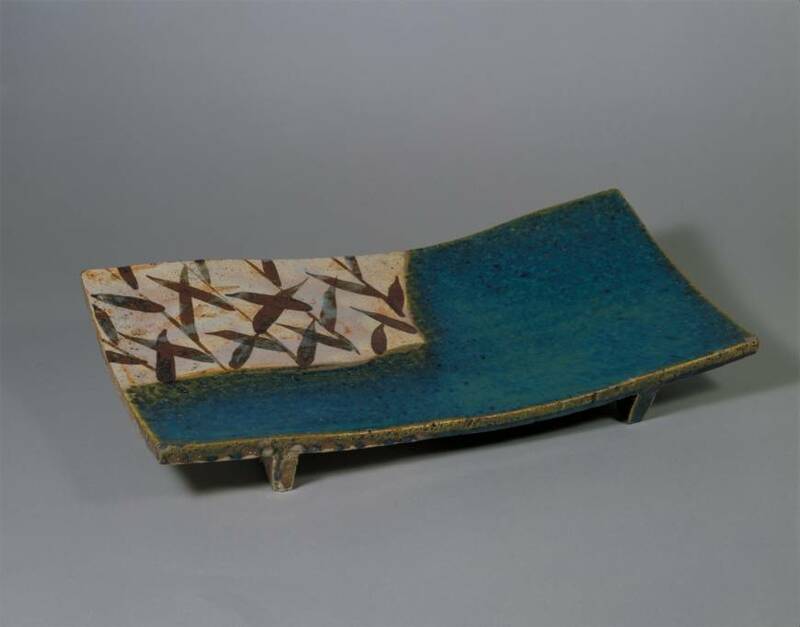 In his pottery realm, if something was a failure — as there often are — he wouldn’t throw it away either, as in the case of under-fired brownish Bizen, which he would silver glaze and, voila, create something new! This exhibition is a rousing tribute a truly a revolutionary artist of the kind of genius that perhaps appears around once every 500 years. It will whet your appetite for a wholesome meal using hand-crafted vessels, although the last room, with its virtual sushi meal using virtual Rosanjin vessels, might be the ultimate culinary tease. 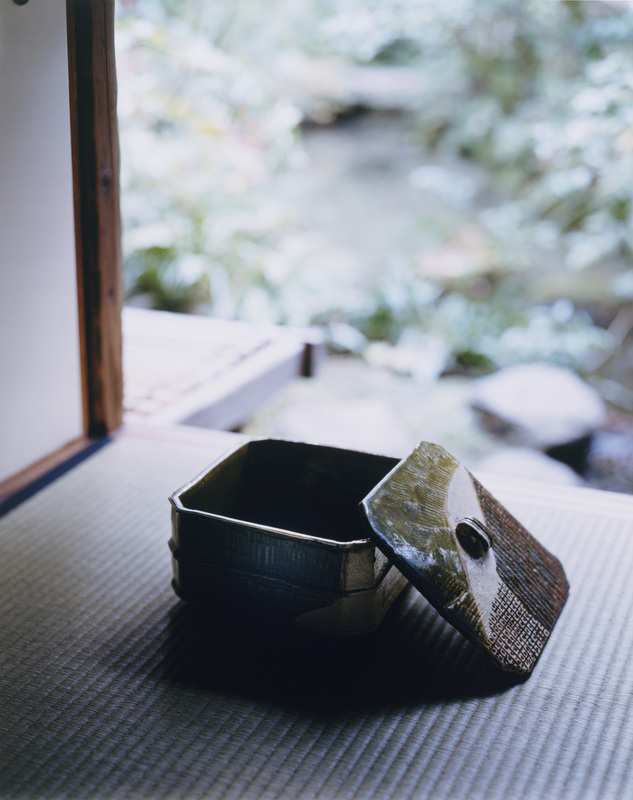 “Kitaoji Rosanjin: A Revolutionary in the Art of Japanese Cuisine” at The National Museum of Modern Art, Kyoto runs until Aug. 16; 9:30 a.m.-5 p.m. (Fri. until 8 p.m.). ¥1,400. Closed Mon. The exhibition then moves to various venues across Japan.